With Labor Day and the unofficial end of summer just around the corner, it’s not too late to invite friends and family over for one last soirée of the season and bid it a proper adieu. In order celebrate this holiday, break out from the typical BBQ and watermelon routine, and treat your guests to a day that will send them into autumn relaxed and rejuvenated. 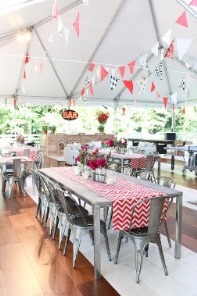 When you begin planning your party, think about how you want guests to mingle around and the general flow of the day. If you want it to remain casual and open, set up a few buffet and drink stations around your patio and backyard area. Scattering a few small tables around allows guests areas to sit and catch up, and hopefully prevents traffic jams around the food areas! Make sure your food choices are both tasty and easy to handle. Mini tomato and mozzarella sandwiches, fish tacos with a delicate jicama slaw, or grilled shrimp kebabs served with a refreshing Basil Infused Blood Orange Cocktail will leave your guests raving and content. If you would prefer a sit down meal, preserve the general vibe of the holiday by setting your table with brightly colored linens: blue and yellow; green and white; pink and orange. Choose your personal favorite! Hanging paper lanterns or a few strings of mini-globe lights help create an intimate, yet playful environment. When considering your menu, serve summer favorites with a little twist: marinated flank steak with a chimichurri sauce; a quinoa, white bean, and fresh pepper side salad; corn on the cob with herb butter. And you can’t forget about dessert! Indulge with individual cherry pies topped with homemade whipped cream. There are few better ways to end a delightful evening than with a tasty dessert. No matter what style of party you end up having, guests will be both impressed with your attention to detail and your keen culinary taste. At Stamford Tent, we hope you had a great summer filled with wonderful memories, and we look forward to working with you in the fall and beyond! Thank you to Watson's Catering, Elizabeth Allen, LMD Lewis Miller Design, and IRIS Photography for creating these wonderful celebrations!